Identify flavoured candy by smell or taste alone, to discover that smell contributes significantly to taste. Tell students what three flavours of jellybeans they will be tasting. Ask students to close their eyes and pinch their nose shut. Give them a jelly bean, and ask them to put it in their mouth and chew a couple of times, still with the nose pinched. (Do this for just a couple of seconds as it is hard to make the instinctive swallow with the nose pinched.) Can they identify the jelly bean taste? At this point students might find it hard, as they just taste sweet. Then ask students to un-pinch their nose and see if they can identify the taste now. As smell molecules from the jellybean pass through their open nasal passage, smells are now detected, and the "taste" should be immediately identifiable. Summarize: most of the "taste" of jellybeans is actually smell molecules. When they make jellybeans they add smells to a sugar paste. When we chew the smells are released. The colour of jellybeans also cues us into what flavour they are. Tell students what three flavours of jellybeans they will be smelling. 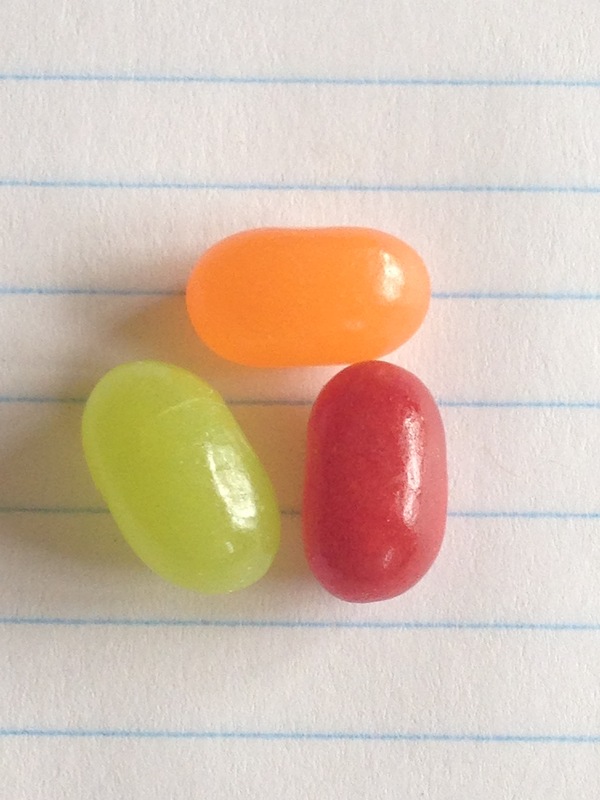 Give a student a jellybean without them looking at the flavour. Ask them to crush it, or break it in half, then smell it. Can they identify the flavour? Then they can taste it. They will likely be able to identify the flavour from smell alone, as the "taste" of jellybeans is determined by the smell molecules added to a sugar paste. Note that texture also plays an important part in food experience, so foods with similar textures may need to be used for when students switch roles.